Did you know there more than 120,000 species of fly? Yes, that’s right 120,000! The good news is that we don’t come into contact with all of them every day, but the six we do encounter is enough to drive us crazy. The company has been in the business of making chemical-free traps. 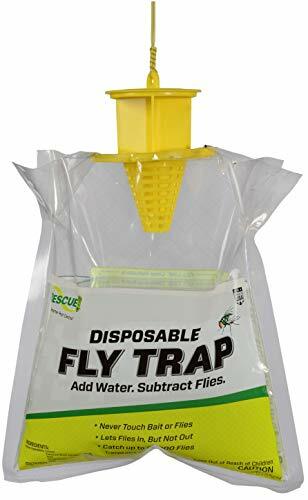 The Rescue Disposable Non-Toxic Fly Trap works by attracting flies into the chamber of the trap with edible attractants they particularly like. To use, you simply add water, which dissolves the substances, activating it. The water also drowns them. There are no harmful chemicals used and certain insects like bees are unharmed. 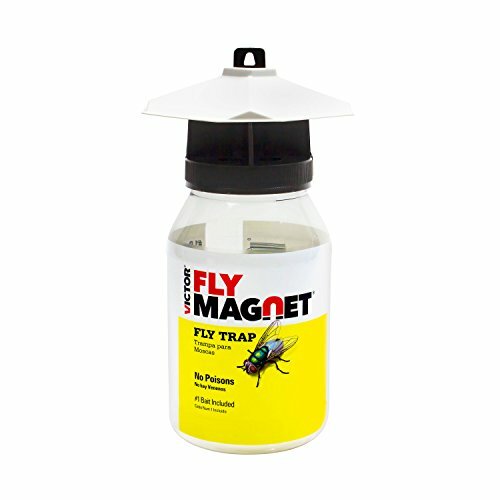 The trap catches flies within a 20-feet range, which means you can keep it away from your house and guests and it’ll still do the job. To dispose of it, make sure it’s sealed properly and throw it in the trash. You can also reuse it—should you decide to—and it travels well without water so you can take it on camping trips, picnics, and other outings that involve food. It also has a good shelf life and can be kept in the garage until you’re ready to use it. Of all the products on our list, this is the most affordable option. Victor is one of the most recognized brands in the pest control industry and has been around for over 100 years. That’s no small feat given all the competition out there. Everything about the eco-friendly fly trap works, from the shiny white top and the diamond-shaped lid that attracts flies to the patented non-toxic bait that attracts a wide range of flies, including blowflies and house flies. Like with the Rescue disposable fly trap, you simply add water to ‘activate’ the bait. There is a marker that shows you how much water is needed. Remember that the flies also drown. The trap uses a patented, non-toxic bait that smells to high heaven but works a charm and it can be used a few times without it losing its efficacy. The bait might lose some of its odor but it’s easy to buy. Because there are no harmful chemicals, it’s safe to use around children and animals, and anyone who suffers from allergies. One warning, though: this fly trap works and it works well, so expect a lot of flies, which you need to get rid of at some point. You might want to just buy a new one rather than reusing it. Fruit flies are a nuisance in the kitchen and around the house, but BEAPCO Fruit Fly Traps will effectively attract, trap and kill all the fruit flies in your home. Each pack comes with six disposable cups and a bottle of solution to put in each cup that will attract the flies into the cup. They are incredibly easy to use and very discrete. You’ll never even notice them and the fruit flies will disappear. 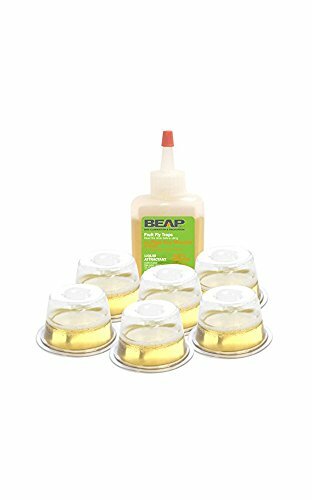 These spill-proof cups are easy to maintain making Beapco Fruit Fly Traps a mess-free solution to your fruit fly problem. This pack traps will last you 180 days because each trap is good for a 30 day period before it needs to be replaces. Running about fifteen dollars a pack they are a very affordable solution to an annoying problem. Flies are basically germ carriers with wings. Because they live on and off dead animals, rotting food, in sewers, and in feces, they carry bacteria wherever they go. Besides being a major irritant, flies are also known for spreading some pretty nasty diseases like leprosy, tuberculosis, anthrax, yaws, cholera, dysentery, and typhoid fever. They are also responsible (indirectly) for poultry death and low weight in cattle. Musca domestica or the housefly is possibly the most common pest and can be found in houses, poultry farms, recreation areas, restaurants, barns, and anywhere else there is food and people. They lay their eggs pretty much everywhere, but poultry or animal manure is their favorite place. Also, decaying garbage provides excellent conditions for breeding. They’re strong fliers but also travel using animals, vehicles, and even wind currents. Stable flies are also called dog flies and they’re the blood-sucking types. The usually bite animals but will also bite humans. Adult stable flies can travel up to 70 miles. They resemble houseflies in both color and size but they have a bayonet-like mouth, designed solely for the purpose of sucking blood. The bites are painful and persistent stable flies will carry on biting even if they’re swatted. Flesh flies are known as scavenger flies because they feed on dead carcasses and meat scraps. Females lay eggs directly on the food source and the larvae eat feed on that. Their life cycle is between eight and 21 days. There are a few species of both types that are found in residential areas. Bluebottles, green bottles, and bronze bottles are usually more abundant in these areas. They breed in animal manure, decaying animal matter, and scraps of meat. Adult flies are very active indoors and are attracted to light, which you probably didn’t know. Their entire life cycle lasts between nine and 21 days. What Attracts Flies to Your Home? No matter how clean you keep your house, there’s still a chance of flies. Any food smell is an attractant so unfortunately there’s not much you can do. Garbage piles draw flies too because of the rotting waste and food. Flies live off decaying things. Ripening fruits attract flies because of the scent. Feces and manure are attractants so if you have pets of any type you can be guaranteed of flies. Also, if an animal like a squirrel or a bird dies nearby, the carcass will attract the flies. They’re not dangerous as in they can rip your face off or attack you in swarms. The only flies that bite are horse flies, but that doesn’t mean the rest are harmless. Flies are basically germ carriers with wings. Because they live on and off dead animals, rotting food, in sewers, and in feces, they carry bacteria wherever they go. For example, the fly sitting on your sandwich right now was probably in a pile of doggy doo two minutes earlier and somewhere even worse 20 minutes before that. Obviously, it is totally impractical to set up hundreds of Venus flytraps around the house. Fortunately, there are various ways you can trap flies, with some being more effective than others while a few are a lot less appealing. Each seems to have its own pros and cons, so the final decision will come down to your personal preferences. Zappers are highly effective but, let’s be honest, they can’t be used in areas where food is being prepared. For home kitchens and restaurants a trap with a sticky adhesive is a better choice. UV lights get rid of flies quickly and effectively and you don’t have to worry about unsightly sticky papers or knocking things over that have liquid inside. The only downside is that not all flies are attracted to UV lights. A simple but effective way of trapping flies is with adhesive papers or ribbons. These work really well but they’re not particularly nice to look at and are best suited for outside and in areas where they won’t be seen. Containers, either bags or bottles, have a way for a fly to get in but not out and it’s usually filled with a liquid that serves as an attractant. The idea is that the flies eventually drown. There are reusable ones as well as types that can be disposed of. We prefer the disposable ones personally.